Yoga inversion poses are Asanas (yoga poses) where feet are raised above the head like headstand (Salamba Sirsasana) or shoulder stand (Salamba Sarvangasana). Practicing inversion poses helps us to see our world in a different angle, an angle that we hardly see; upside down. The concept behind inversion poses is expressed in yoga texts as Viparita Karani, meaning “opposite process”, which simply means facilitating a different perspective. Physically, our body is normally supported by our legs and feet but during inversion poses, our body is supported by our hands or/and head. In addition to that, this exercise is more than just a physical change in direction. It also increases our ability to adapt to change instead of being stuck in our everyday habitual state, which increases our capacity for growth and transformation. a) it reverses the blood flow in the body and improve circulation as it uses gravity to provide the brain with more oxygen and blood, thus increasing mental functioning, and improving concentration and memory. b) it gets more blood moving to the brain, which results not only in physical invigoration but mental revitalization as well. c) it increases core strength: shoulders and arms-especially for women who tend to be stronger in the lower body, inversions create body balance by developing upper body strength. To hold a straight headstand for an extended period of time, we must engage the obliques, the rectus abdominus and the transverse abdominus. 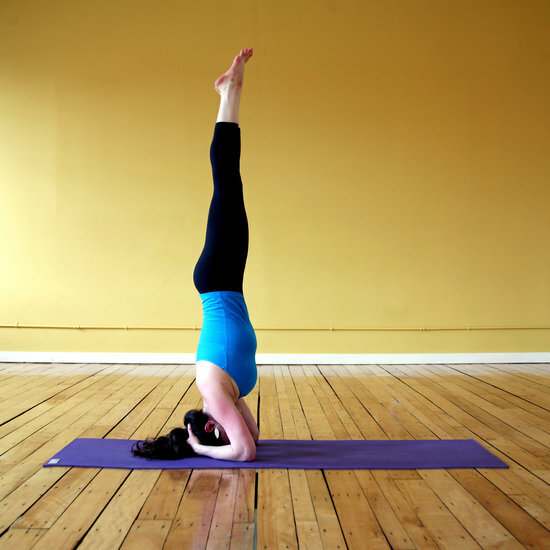 d) inversions stimulate and provide refreshed blood to the pituitary and hypothalamus glands. These glands are vital to our well-being and they also regulate all other glands in the body(thyroid, pineal and adrenals). e) any fluid that is retained in the feet is able to drain(edema), therefore reducing the onset and prevalence of varicose veins. f) inversions increase digestive fire and body heat. The intestines are cleansed by reversing the pull of gravity, while releasing congested blood to the colon. Experiencing the inverted yoga poses personally have progressively amazed me. While I could manage the Halasana(plow pose) and Salamba Sarvangasana (shoulder stand), each time the experience seems to differ: holding the pose while doing the Ujayi breathing and gazing at the right spot all at the same time. And each time the pose becomes more comfortable with more practice. While I was struggling to get my legs up the in air for Salamba Sirsasana the 1st week of the course, the 2nd week had successfully lifted my legs off the ground(while against the wall). Now that it’s coming to the 3rd week, I’m looking forward to hold this pose without the wall and stay longer at it! Your UP means my DOWN?? This was the most daunting aspect of any yoga class I entered. The point where the instructor would say “ Shoulder stand” or “Headstand”, would fill me with fear. Within 10 days of my journey into the 200hr TTC, I was up (or down as the case may be) in a headstand!! Even though I like very detailed alignment instructions, the first 10 days caused a lot of confusion in my mind… Especially when it came to retracting and bringing the shoulder blades down and away from the ears. So I am going to be upside down, but I should move my shoulder blades down? Or up? Well, finally by about Day 9, my brain caught up with this whole inverted alignment, and somehow, it just happened!! Slowly over the next few days, the feeling of fear transitioned to amazement and wonder. A few more days into it, I actually started breathing and relaxing. I loved it up there… or down there… and would want to stay inverted as long as my arm strength would let me. Then I thought, lets try something that even in my wildest dreams would not be a possibility. Pincha Mayurasana and/or Vrischikasana. All of a sudden here I am, fast-forwarding to the last few days of the course, post an awesome preparatory class taught by one of the students (Jane Wei Ling). With the help of some of my fellow classmates (Joseph, Reisal and Pei Ni) and about 15-20 failed attempts, I finally got up (down!!) into something that looked like a hybrid of the elbow stand and the scorpion. At this point, I am trying to better it. A little bit, everyday. The benefits of inversions are plentiful: (aside from the extreme exhilaration of finally getting there!) Firstly, it is just fantastic to reverse the natural blood flow through gravity, sending fresh oxygen rich blood to your head! Aside from looking positively radiant after an inversion, the increase of blood flow to the brain nourishes the cells, boosting brain power, concentration and awareness. Inversions also alleviate depression, by stimulating and balancing the release of neurotransmitters and hormones in the body through increased blood flow to the pituitary gland. Spinal alignment is increased, digestion is improved and constipation is relieved. To conclude the topic, I would like wish all my fellow yogis the best of luck wherever you may be in your journey of inversions.